The hero of England’s victorious 2005 Ashes campaign has fought a constant battle against injuries and will now concentrate on one-day cricket. The 31-year-old is currently fighting to be fit for the second Test at Lord’s because of a knee problem. The latest knee injury flared up after the drawn first Test against Australia in Cardiff and Flintoff explained: “It’s been something I’ve been thinking about for a while and I think this last problem I’ve had with my knee has confirmed to me that the time is now right. “I’ve been through four ankle operations, I had knee surgery just a couple of months ago and had three jabs in my knee on Monday, just to get me right for this Test, so I took that as my body telling me that I can’t cope with the rigours of Test cricket. After a duck and then three in the first Test at Lord’s, he made half-centuries in each innings and took seven wickets as England fought back thrillingly to win by only two runs and level the score at Edgbaston – where his hand-on-shoulder consolation for a beaten Brett Lee became perhaps the iconic image of the whole series. Flintoff’s maiden Ashes hundred helped bring a second home win in Nottingham and there were more runs and wickets as England regained the urn in a fifth-Test draw at The Oval. Australia captain Ricky Ponting said his team were “a little surprised” by Flintoff’s decision, but added they will not treat him any differently for the second Ashes Test at Lord’s which begins on Thursday. “We know how big a figure he is in the England team,” said Ponting. “I think you could even see that last week with his first spell back in the Test side – the whole ground sort of lifted, it changed the real feel around the ground last week. Flintoff’s former Lancashire team-mate Sourav Ganguly said he was paying the price for England’s over-reliance on him. “I always said England needed to balance his bowling with his batting if they wanted him to survive longer in Test cricket,” said the former India captain. “With England, every time they are under pressure it is Freddie with the ball because he is their best bowler. “He’s a big boy and injuries are part and parcel of sport, but there are other fast bowlers around the world who are running in and keep playing and doing well in Test matches. “It’s interesting that he’s done it now – it’s been talked about a great deal and has been a bit of a distraction,” he told BBC Radio 5 Live. “There’s a very lucrative one-day league – the Indian Premier League – for which he’s now fully available,” he added. “They’re paid per match, so if he goes and plays the whole thing, he picks up all the money. Recently retired American football star Steve “Air” McNair has been found dead with multiple gunshot wounds in Nashville, along with a dead woman. “Air” McNair, who played 13 years with the National Football League and was a quarterback for the Tennessee Titans, retired last year. A pistol was found near the dead woman, aged 20, who had received a single shot to head, police said. 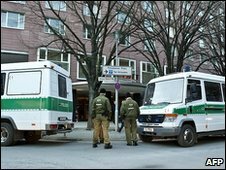 The bodies were found in a flat used by the former footballer, who was 36. First reports said McNair had suffered a gunshot wound to the head but police quoted by the Associated Press said later that he had been “shot multiple times”. Nashville police spokesman Don Aaron identified the woman as Sahel Kazemi, whom he called a “friend” of McNair’s. The footballer’s wife, Mechelle, was “very distraught” and police do not believe she was involved, the spokesman added. 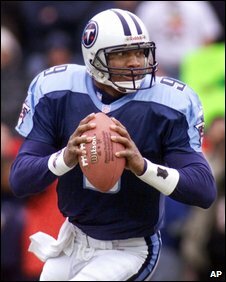 McNair led the Titans within a yard of forcing overtime in the 2000 Super Bowl, which they lost 23-16 to the St Louis Rams. He also played for the Baltimore Ravens before retiring in April 2008 after injuries. “We don’t know the details, but it is a terrible tragedy and our hearts go out to the families involved,” NFL commissioner Roger Goodell said in a statement. Titans owner Bud Adams was “saddened and shocked” by news of McNair’s death. “He was one of the finest players to play for our organisation and one of the most beloved players by our fans,” he said. There was no change of momentum early in the second set, Federer firing a vicious cross-court forehand in game one and repeating the trick to break for 2-0. A humiliatingly swift defeat looked on the cards for the Briton, who appeared to be struggling with a knee problem, but he got a foothold in the match when Federer’s level finally dropped in game three. Murray pounced with a big cross-court forehand and a powerful backhand drive that Federer could not control at the net, and the Scot finally had a break of serve. The match appeared well and truly on when a couple of loose errors saw Federer slip 0-40 down again at 2-2 but he continued with his attacking policy and, thanks in part to one dubious line call, he managed to escape. And the relentless pressure applied by Federer eventually paid off when he broke to love to take the second set in game 12, making a lunging backhand volley, a successful chip and charge, a thumping smash and a running pass. It was irresistible stuff from the champion and he swept into a 5-0 lead in the third set before Murray staged a late rally to cut the deficit with his second break of the day. But it only delayed the inevitable and Federer put the British number one out of his misery on his second championship point, winning an epic rally with a smash that Murray could not return. “I had a great tournament but I came up against, in my opinion, the best player ever to play game the today,” said Murray. “I got the better of him the last two times and he definitely set the record straight today. I’ve learnt I’ve got a lot of improving to do if I want to win one of these things. Roger Federer was at his brilliant best as he won a fifth straight US Open title and ended Andy Murray’s hopes of a first Grand Slam crown in New York. Murray, 21, had been trying to become the first British man since Fred Perry in 1936 to win one of the four major singles titles, but he was outclassed. Federer stormed to a 6-2 7-5 6-2 victory in one hour 51 minutes at Flushing Meadows. The Swiss now has 13 Grand Slam titles, one behind record holder Pete Sampras. Federer joins Sampras and Jimmy Connors as a five-time winner of the US title in the Open era, but neither American won in five successive years. He is also the first man ever to win five consecutive titles at two Grand Slams – the US Open and Wimbledon. “It definitely feels great,” said Federer afterwards. “After this year, to take this home is incredible. It means the world to me. Murray was playing in his first Grand Slam final and came into the match on the back of a first-ever win over world number one Rafael Nadal. But the confidence the Scot carried from that landmark victory soon took a battering as Federer opened in spectacular fashion. Having failed to win a major title so far this year, and having lost his number one ranking to Nadal, the second seed had been desperate to arrest his slide. And after approaching his best in beating Novak Djokovic in the semis, Federer was at the top of his game from the start of the final. Murray had to stave off a break point in game three but could not repeat the trick two games later, a double fault and two errors handing Federer the advantage. The champion’s confidence was obvious as he moved 4-2 clear with an outrageous forehand drive volley on the run, before more brutal forehands forced another break in game seven, and he wrapped up the set in 26 minutes. McLaren’s Lewis Hamilton was stripped of a dramatic victory in the Belgian Grand Prix after stewards handed him a 25-second post-race penalty. The Englishman was demoted to third place behind Ferrari’s Felipe Massa and BMW Sauber’s Nick Heidfeld. The move came after an investigation into a late-race battle between Hamilton and Ferrari’s Kimi Raikkonen. 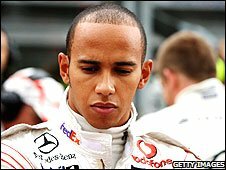 Hamilton’s lead over Massa in the title chase has been cut by two points. Before the penalty, he had extended his lead over the Brazilian to eight points, with Raikkonen effectively out of the running on 23. Roger Federer came through a desperately tense five-set encounter with Igor Andreev to keep his bid for a fifth straight US Open title alive. The champion showed the frailty that has dogged him all year as he was taken to a fifth set but raised his game to win 6-7 (5-7) 7-6 (7-5) 6-3 3-6 6-3. Andreev took the first set and had seven break points at the start of the second but Federer managed to hang on. 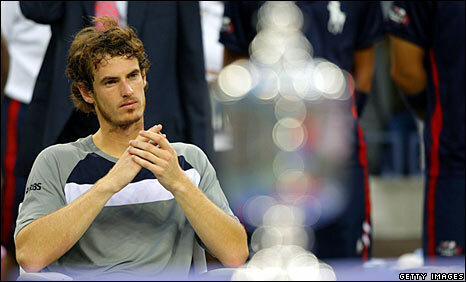 He will face Gilles Muller of Luxembourg in the quarter-finals. Muller, a qualifier, stunned Russian fifth seed Nikolay Davydenko 6-4 4-6 6-3 7-6 (12-10) in a dramatic match. Federer had looked superb in his third-round win over Radek Stepanek, but his recent frailties were in evidence throughout against Andreev on Arthur Ashe Stadium. He made 60 unforced errors and faced 15 break points, and his survival was largely due to the fact that Andreev converted just two of them.The Russian broke at the first attempt and should have taken the set from there, but he allowed Federer back in at 5-5 before edging the tie-break. A nervous Federer then framed a smash to slip 15-40 down early in the second but Andreev failed to capitalize on five break points, and a further two in the next game. Still the world number two struggled with his form, missing two set points in the second set tie-break before Andreev handed him the set with a wayward forehand. That gave Federer a temporary boost and when he cracked away a cross-court forehand to break for 3-1 in the third, the game appeared up for Andreev. But at the same stage in the fourth set Andreev benefited from a hugely fortuitous net cord and confidently served out to take it to a decider. At last, Federer reminded everyone of why he has won 12 Grand Slams as he stepped up a gear, moving 3-0 clear after winning an epic rally to break.It was hardly downhill all the way after that as the Swiss fought off four break-back points at 4-2, but his fighting spirit saw him through to a meeting with Muller,the world number 130. “He was playing well,” Federer said of Andreev. “He broke me so easily at the beginning and I was struggling to get in a groove from the baseline. Davydenko could not cope with Muller’s serve-volleying and a barrage of 20 aces on Louis Armstrong Stadium. Muller pulled out his best shots when it mattered, serving an ace to save a set point at 4-5 in the fourth set and saving another with a big serve at 6-7 down in the tie-break before getting a net-cord on match point. In the same half of the draw, third seed Novak Djokovic edged out Tommy Robredo 4-6 6-2 6-3 5-7 6-3. The Serbian will play American Andy Roddick in the last eight after the 2003 champion thrashed Fernando Gonzalez 6-2 6-4 6-1.